For me Art & Design go hand-in hand. Over the last twentyfive years I designed and crafted Leather and Silk Fashion in Germany, Bathmat Designs for the European Market, created my own Labels “BonnyBean” for Children’s Beanbags and “Positive Fashion for Kids”. After studying Interior Design I created Home décor items, designed custom-made furniture, planned Interior make-overs and worked on Retail Décor Projects. Helping children to develop self-esteem and inner values is an important task. Our children are the future and their moral beliefs will guide the next generation. Inner strength and positive thinking will help them to become young adults who can act with generosity and courage. As a mother I realized, that a lot of children’s clothing, especially for boys, show negative messages and images. That’s why I decided to design my own range of t-shirts, caps and badges. 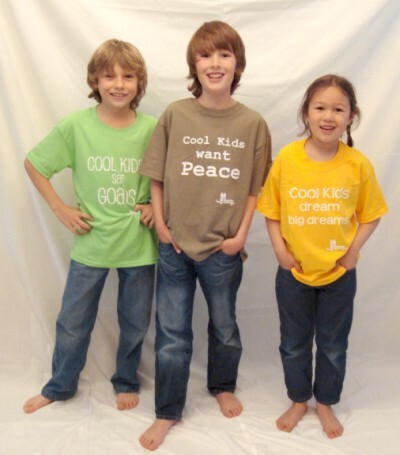 “Cool Kids care for others“, or “Cool Kids respect other cultures“ are some of the messages, that reflect tolerance and respect.